Thanks everyone for a great community clean-up on Oct.22! – We had between 30-40 people; a mixture of neighbourhood and church families. – At the centre, we fixed the fence and removed the weed patch at the viewpoint. Rick Weirzbicki was the amazing foreman. (And he brought food!) We pruned a lot nearby along Edgevalley Drive. 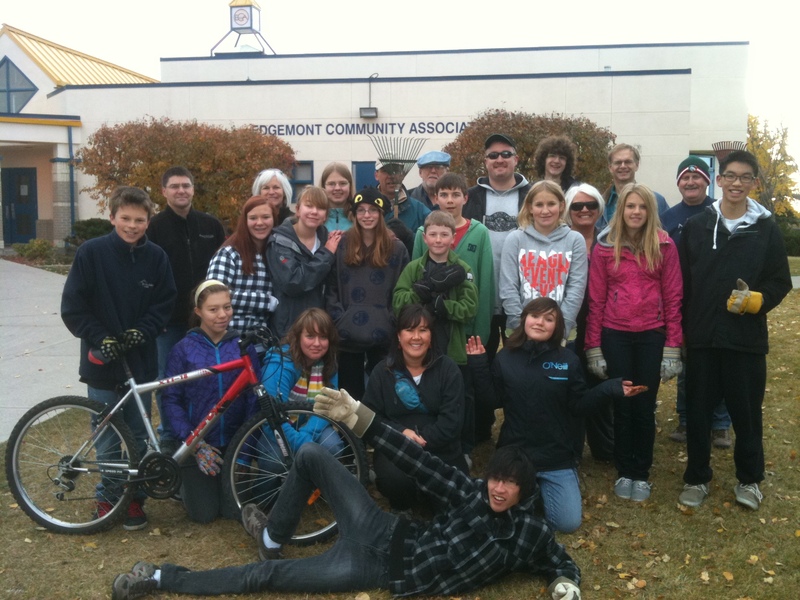 – Our teams cleaned all the slopes, school yard, and around the ECC building. We also picked up around the signs and surrounding areas (e.g. Esso, Petro-Can, near Co-op, etc) and around the rink and courts. So many bags, we filled the dumpster! – Bonus: Found a bike, part of a guitar and a backpack! 🙂 Thanks to Scottish neighbour Helen who dropped off Starbucks coffee and muffins for the overtime workers. And thanks to neighbours who waved, thanked, stopped and gave words of support. A successful day. Thanks again everyone!